5. Come into the Garden, Maud! D. C. Hall's New Concert and Quadrille Band reprised the repertoire, style, and spirit of the illustrious Hall Brothers' Band that performed to great acclaim, from the late 1840s through the 1870s, from Canada to Louisana. 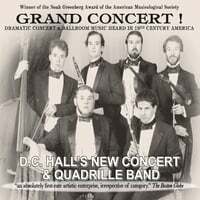 Known for their Exquisite musicianship, vivid performances, superb research, and uncompromising standards, D. C. Hall's New Concert and Quadrille Band was awarded the Noah Greenberg Award of the American Musicological Society, in 1990, for distinguished contribution to the performance and study of historical music. Although the group no longer concertizes together as Hall's New Band, their legacy survives in two extraordinary recordings. Their first recording, Grand Concert!, was recorded on the stage at Mechanics Hall, Worcester MA, upon very stage which the original Hall's Brothers' Band concertized. It was recorded and edited by renowned, award-winning engineer, Bud Graham. Members of D.C. Hall's New Concert and Quadrille Band include: Peter H. Bloom, flute and piccolo; Steven Jackson, clarinet; James H. Johnston, violin; Patrick G. Jordan, viola; Henry Peyrebrune, bass violin; and Kevin M'Dermott, Tenor.